I’m Charlie Nardozzi and this is the Vermont Garden Journal. The leaves are dropping, the cold is coming, and it’s time for carving pumpkin. But did you know that the first Jack-O’-Lantern was actually a turnip? The Irish story goes there was an unsavory character named Stingy Jack who tricked the devil into not claiming his soul. When Jack died the devil couldn’t take him so he sent him off into the dark night to wander endlessly with only a piece of coal burning in a hollowed out turnip to light his way. He’s was referred to as Jack of the lantern. Folks in Scotland and Ireland carve scary faces in turnips, beets and potatoes and place them in their windows on all hollow’s eve to scare off old Jack when he passed their house. When these immigrants arrived in America, they used the pumpkin to honor the same tradition. While we may not have to worry about Jack, there are fun activities to do with pumpkins this season. Consider cooking pumpkins as the early European settlers did. Hollow out the fruit, save the seeds for roasting, and fill it with a mix of milk, spices and honey, then bake it in hot ashes on an open fire. When carving pumpkins kids often get disappointed when the pumpkin is too hard to cut or the fruit rots quickly after carving. 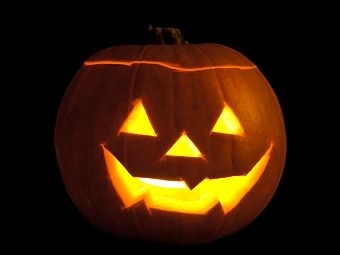 To make carving easier, soak your pumpkin in cold water overnight. It will absorb the moisture and firm up the flesh. To help the masterpiece last longer, wash it with a bleach solution to kill any fungal spores and apply petroleum jelly to the surface to prevent it from drying out. Consider getting a little crazy with lighting using blinking bulbs or a strobe light to create the scariest pumpkin possible. Now for this week’s tip, if you love tulips, but hate how they peter out after a few years grow the species tulips. These low growing bulbs naturalize, slowly spread, and come back consistently each year. Next week on the Vermont Garden Journal, I’ll be talking about fall garden cleanup. For now, I’ll be seeing you in the garden!